Cellist Naoya Kanai and Crystal Chao will perform music for piano and cello. Naoya Kanai performs and teaches regularly in the Bay Area. He has performed across North America, Europe, and Asia, including concerti with the California Youth Symphony and Stanford Symphony Orchestra, as well as principal positions in the San Francisco Symphony Youth Orchestra and Aspen Concert Orchestra. He has also appeared at the Banff, Orford, and Takefu festivals. Crystal Chao is a new music enthusiast, she studied with Evan Ziporyn of Bang on a Can at MIT, and with pianist Timothy Whiteboard of Georgia Tech's contemporary music ensemble-in-residence Sonic Generator. She also programmed and performed with a marimba robot named Shimon. Growing up in Edison, New Jersey, pianist Crystal Chao was a scholarship student of Jeffrey Cohen at the Manhattan School of Music (MSM) Preparatory Division. During her youth, she won two Honorable Mentions in the MSM Concerto Competition, performed at Carnegie Hall's Weill Recital Hall as a winner of the Associated Music Teachers League Young Musicians Concert Auditions, and participated in the Texas Music Festival and Aria International Summer Academy. She received her B.S. in Computer Science with a minor in Music from MIT, where she studied with Randall Hodgkinson of the New England Conservatory of Music faculty as an MIT Emerson Fellowship recipient and was an active member of the MIT Chamber Music Society. She then received her Ph.D. in Robotics with a minor in Music from Georgia Tech, where she performed with the Georgia Tech Symphony Orchestra as a winner of the student Concerto Competition, played in the New Music Ensemble, and accompanied the Chorale. A new music enthusiast, she studied with Evan Ziporyn of Bang on a Can at MIT, and with pianist Timothy Whiteboard of Georgia Tech's contemporary music ensemble-in-residence Sonic Generator. She also programmed and performed with a marimba robot named Shimon. Currently she is Chief Scientist at Huawei Technologies where she leads a global robotics project. 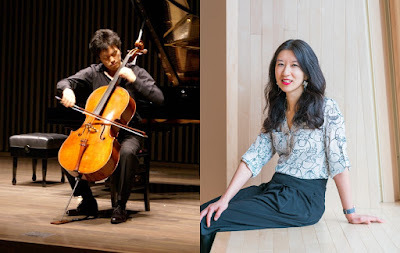 Cellist Naoya Kanai was raised on the Peninsula and studied with Irene Sharp, as well as Christopher Costanza and the St. Lawrence String Quartet. After completing a B.A. in Human Biology from Stanford University, he continued his training in the studios of Fred Sherry and Richard Aaron at The Juilliard School, receiving a Master of Music. Naoya has performed across North America, Europe, and Asia, including concerti with the California Youth Symphony and Stanford Symphony Orchestra, as principal cellist in the San Francisco Symphony Youth Orchestra and Aspen Concert Orchestra, and at the Banff and Orford festivals. Naoya later moved to Japan, where he worked with cellist Nobuko Yamazaki at the Tokyo University of the Arts and performed at the Takefu International Music Festival. He currently works on fraud-related problems as a data scientist in the Trust team at Airbnb, and is active as a freelance cellist in the Bay Area.